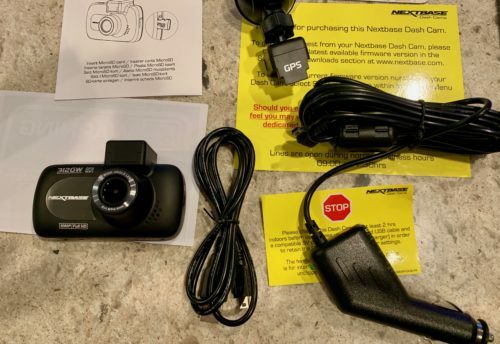 Nextbase 312GW and 612GW are car mountable dash cameras. Both models feature night vision, GPS logging and WiFi enabled functionality. The 312GW records in 1080p and the 612GW records in 4K. The 612GW features a touch controlled LCD display while the 312GW’s display is button controlled. Packaging for both dash cams are neat and informational. The box contains the dash cam, car charger, USB charger, GPS unit, suction mount, sticker saying the car is protected and instructions. 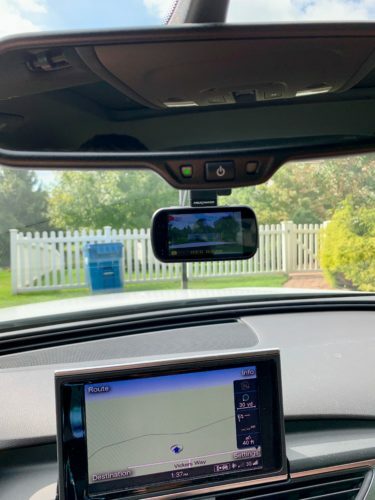 The 612GW also includes a dash mount option in addition to the windshield suction mount. Nextbase is a U.K. based company and the support phone number is U.K. based only, however their website has a very responsive chat feature. Other than some of the wording and spelling which is in British English, the instructions are clear and easy to follow. 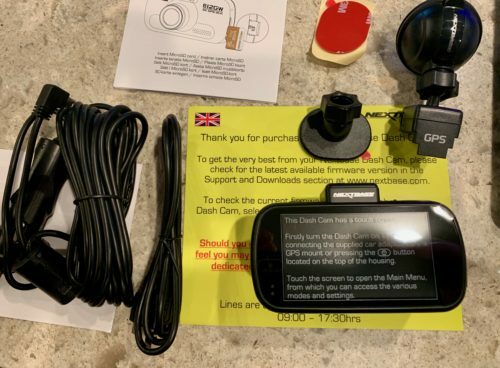 The box on both units include two bright yellow cards with instructions to update the firmware if available and to charge the camera for two hours before use. The information to update the firmware is listed on their website and is easy to follow. For both cameras the process is to copy the firmware update file to a blank microSD card from a computer to the camera. Then put the card in the camera with the unit off, turn the camera on and it does the update. Both updates went fine with no issues. There is an option to format the microSD card from within the camera, which is also required after the firmware update is completed. The cameras have two locations from where you can charge them. One in a miniUSB port on the top of the unit and the other is on the GPS attachment. Either one will charge the camera using the supplied USB cable or car charger. The GPS unit slides on the top of the camera and snaps in place. While the cameras were charging I used the time to run the charger cable in my car. Before attaching the camera to the car there are a few steps to do in settings. On the 312GW access to the settings is done by physical buttons and on the 612GW the settings are the same except on a touch display. The main initial settings are the date, time and language. There are many other options that control everything from video quality, length, parking mode, time stamps and many others. This is where you can also turn on the WiFi on the camera. The iOS companion app is needed for the WiFi function and is available in the App Store. 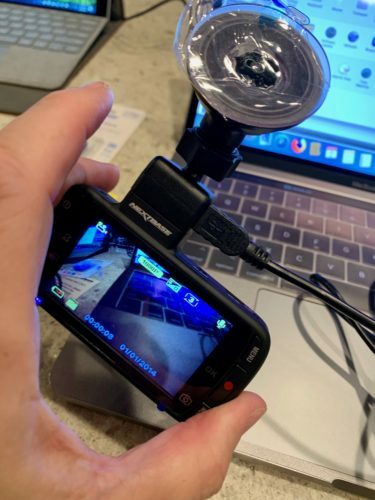 Once the app is installed and the WiFi on the camera is on you are able to connect your iPhone to the WiFi and access settings and recorded videos. Once the setup is complete it’s time to start driving! Attaching the camera using the suction to a windshield is an easy task. The camera attaches to the GPS unit which is attached to the suction. Plug in the car charger, start the car and it starts up and starts recording. The MicroSD cards hold the recording and the recommended size for the 312GW is 32GB while the 612GW recommends a 64GB. The video starts recording as soon as the car charger gets power from the car, in most cases when the car starts up. It will continue to record until the car charger’s power turns off. While driving you do have control to stop and start the recording or to take photos. There is also a protected mode which will prevent a particular recording from being overwritten. There is a screensaver option as well where the 312GW shows a blank screen and the 612GW shows your estimated MPH. But for the most part you aren’t supposed to even think about it or know it’s there. Turn on the car and drive, turn off the car when done driving. There is also a parking mode on both cameras. Parking mode will turn on the camera, record a short clip and then turn it off if the sensor detects movement. The idea is if someone hits your car while parked you can see what happened. Of course this will only show video in the direction the camera is pointing. I tested this by shaking my car while off and it did work as advertised. Now that the photos and videos are on the camera there are two options to get them onto your phone or computer. On the phone, open the app and connect to the camera’s WiFi. There is a section of recorded videos and pictures where you can download them to your Camera Roll or All Photos, protect them or delete them. Once on your iPhone in the Photos app you can send, share or post them or do whatever you can do with any other video or picture. Interestingly, the cameras takes two separate videos at the same time. One is in lower definition to make it quicker to copy to your phone. The companion app isn’t going to win any awards, but I found it perfectly fine for what it needs to do. It is easy to navigate and it was stable. The other method to get the media files is to connect the camera to a computer using the supplied USB cable. Once it’s connected the camera goes into storage mode and lets you copy over the files. The videos and photos on both the 312GW and 612GW looked good. The 612GW records in 4K so the videos are better than on the 312GW, but both were clear enough to serve the purpose. The setup and use of both the cameras was a very pleasant experience. 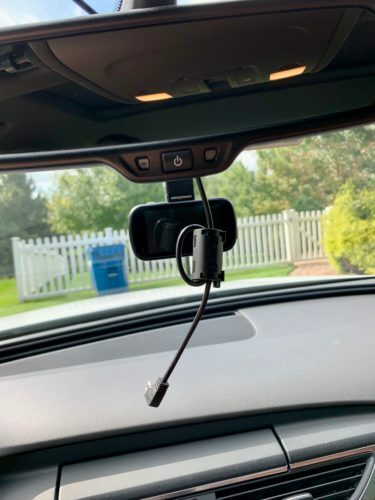 Everything just worked as it is supposed to and it convinced me that a dash cam is a good thing to have, just in case. 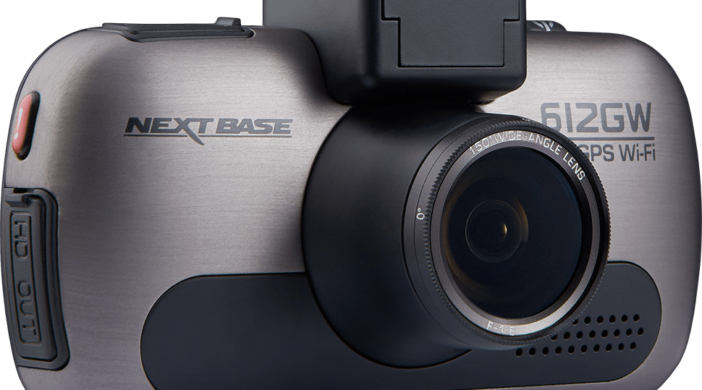 If you are in the market for one both the Nextbase 312GW or 612GW are an excellent choice. MyMac Review Rating is 9 out of 10. Setup and use is a breeze and video quality is great. The companion app could use a little tweaking and the price is a bit higher then some of the other dash cams on the market.